At the University of Chichester we run a number of events for businesses in West Sussex. Some are for start up businesses (Business Boot Camps) and others for established businesses. The University of Chichester Business School runs the Business Knowledge Network. The network is aimed at all businesses and organisations that want to come along and meet other businesses, learn from the months 'Hot Topic', drink tea and eat cake. Our aim is that you will take away at least one idea that you can implement in your business each month, either from the guest speaker or from networking with your business peers and our in-house experts. Sales is something that nearly everyone struggles with. It is something that we are always doing, selling and pitching. Whether that is for work, business or family and friends. If you are not generating sales in your business then you won't have a business for long. In this month's event, we are going to try and unpack 5 key things that you should be considering when selling. This will which will then be followed up with a group discussion and Q&A where we can discuss, as group, what has worked for you and how you have achieved more sales. What is holding you back from creating more sales? What has helped you achieve more sales? The talk will be delivered by Gareth Sear - Business Start Up Manager as the University of Chichester Business School. Gareth has been working in Business Support for the last 10 or so year, helping business to achieve growth. Prior to this, he has held various sales positions from Key Account Management to Recruitment and Retail Management. THIS MONTH’S HOT TOPIC IS CONTENT. CONTENT FOR WEBSITES AND YOUR DIGITAL MARKETING. It should just be a hot topic for one month it should permanently be a hot topic. Why? Because everything about your marketing is about content. It always has been really, it’s just now it seems to have become more important, especially if you want to get good Search Engine Results Page rank. 1. Text: People like text. We still like to read. The search engines like text. They like to read and absorb what you are writing, ready to show it to someone who is searching for what you are writing. 3. Video: People absolutely love and adore video. The biggest video platform on the web, You Tube has 400 hours of video uploaded every minute. 3 billion searches a month. A billion users. Search engines and Facebook absolutely love and adore video. There are many other different types of content you can create to get your marketing message across. 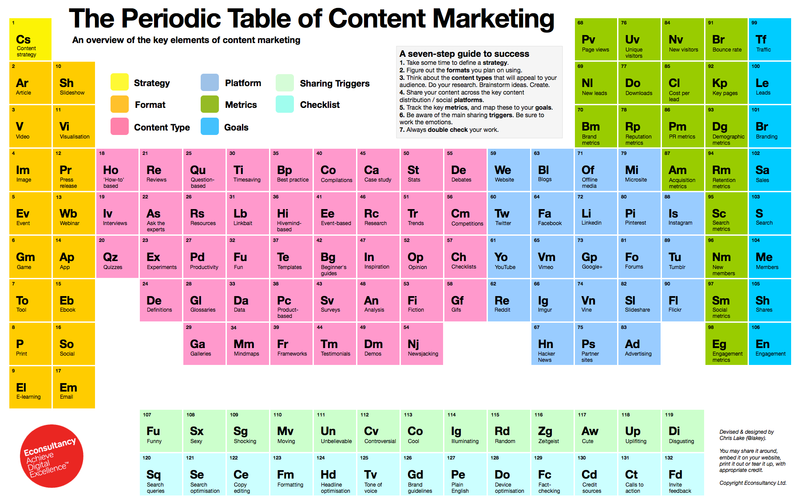 Have a read of the Content Periodical Table from E-Consultancy for ideas. You need content to inform, educate, entertain and engage your customer segments. The more you engage with them, the more they are likely to buy from you. Content will also help you to retain your current customers and get them to buy from you again. If you want your website to rank well in the search engine results pages then you need to add content to your website. Regularly. Search engines like website that are continually updated, it shows you care about your website and your customers. If you care about your website and customers then the search engines will care about you. The more content you have that is fresh, relevant and original the more they will care about you. With content on your website you can share pages from your website through other platforms such as Facebook and Twitter. The can help you reach new customers. Always focus on how you are creating value for your customers and what you want them to do. Where are they in the buying cycles? You may have different types of content for customers at different stages. Think, are you reaching out to new customers, are you trying to get them to buy or are you keeping current customers engaged? Do some ‘keyword’ research – find out what people looking for your business are searching on. This will give you ideas. Look at what other people in your sector are doing with regards to content. Follow their example. Invite some friends over for dinner and a glass (or two) of wine. Put up a white board and brainstorm ideas for content. What is in the news that you can create content from? Always keep an eye on what is trending and what is happening in current affairs. You’ll be amazed at how much this can inspire content creation. A great tool to look at is Google Trends. Just a brief look at content creation. I read recently that a business now, before anything else, must now be a digital media company. I believe that this is true. Enjoy your content creating and may it bring you the joys of a successful business. March 2016 - Phil Packer MBE - His story and how he founded the British Inspiration Trust. Read a great article from Savvy Communications on the top ten things she took away from the talk. February 2016 - Pitching your business. 6 people pitching. Who will you buy from? January 2016 - Business Round Table. Continuing our programme of small group business discussions. This excellent event has run for 13 years and provides an opportunity for micro and home based businesses to find out what support they can get to grow and develop their business. There are over 40 organisations and numerous talks - and all for free. The Real Me. How to identify and fill gaps in your business knowledge. We believe passionately in the work that Social Enterprises do. The West Sussex support organisation for Social Enterprises invited us to run a seminar on the topic of 'Pricing You Products and Services' with Social Enterprises in mind. The workshop was interactive and informative, with plenty of useful information on what to consider when you are developing your pricing strategy. At the 2016 conference we were pleased to be part of the team that delivered the conference 'Getting your message across'. We delivered powerful workshop sessions on 'Verbal Business Cards', by Dr Lyn Batchelor and a Digital Marketing Workshop by Gareth Sear. We want to talk at your events! At The Dome Enterprise Centre and the University of Chichester we are always happy to deliver interesting, inspiring and informative talks, workshops or guest lectures at conferences, networking events and exhibitions. Let us know how we can get involved at your event! Call 01243 812041 or email thedec@chi.ac.uk. Chichester Chamber of Commerce and Industry (CCCI) liaises with the District Council and other partnerships on behalf of businesses in and around the City, to ensure the continued economic prosperity of the area. Our monthly Chamber evening meetings and breakfast meetings feature guest speakers and provide great opportunities for networking, to follow these networking events please visit the following: Chichester Chamber Business Events. Our newsletter provides information to a wider audience. CCCI encourages a culture of best practice, sustainable growth and actively works with the community and tourism to ensure that Chichester remains an attractive place to live, visit and to do business. If you would like to develop your business and have your say, join CCCI and help make a difference. CCCI or telephone: 01243 531765. To follow The Arun Business Partnership networking events please visit the following link: Arun Business Partnership - for information on their fun, free quarterly networking events and other social events.